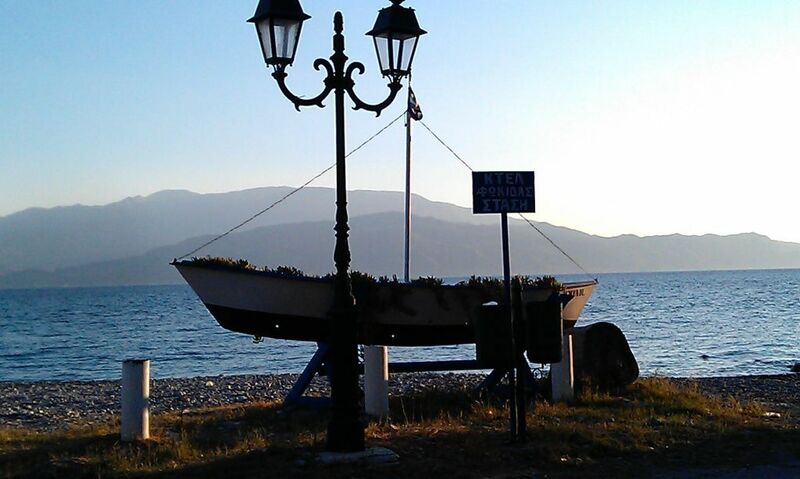 Paralia Sergoulas is a little village of about 250 inhabitants. 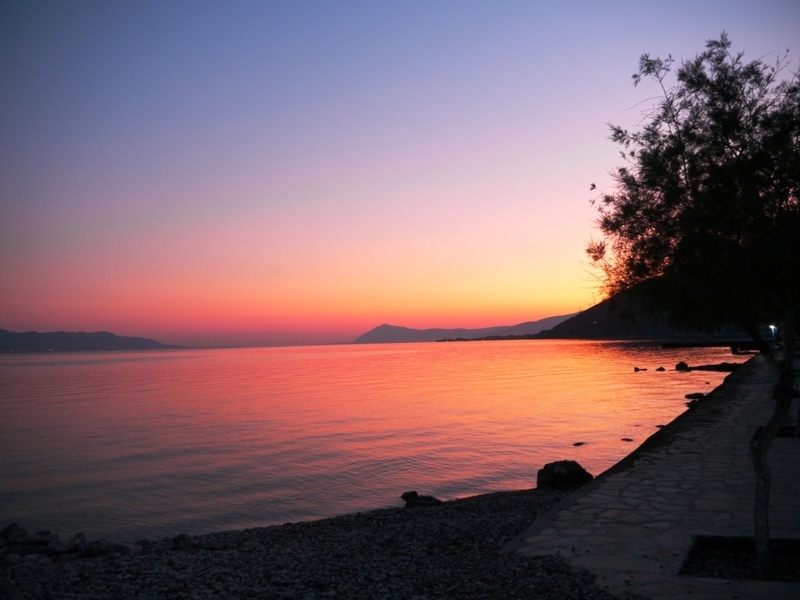 It is located in one of the most beauftiful places at the Gulf of Corinth on the greek mainland. It managed to preserve its typical greek atmosphere until today and hectic progress has hardly reached the village. Traditions are cultivated. This can be experienced at many secular and religious festivities throughout the year. Tourism is only weakly developed in this coastal region, most of it takes the interstate outside the village to more remote destinations and does not disturb. Paralia Sergoulas remains a village of Greeks and even during holiday season you will find few foreigners, although the infrastructure improved considerably in past years. Here, people mostly farm (lemons, oranges, olives), grow vegetables, keep goats or make a living from fishing. Traditionally, they meet strangers with friendliness and regard them as guests. Anyone who has visited Paralia Sergoulas can rightfully say: "I was in Greece!“ Here you are in the "belly of Greece“. 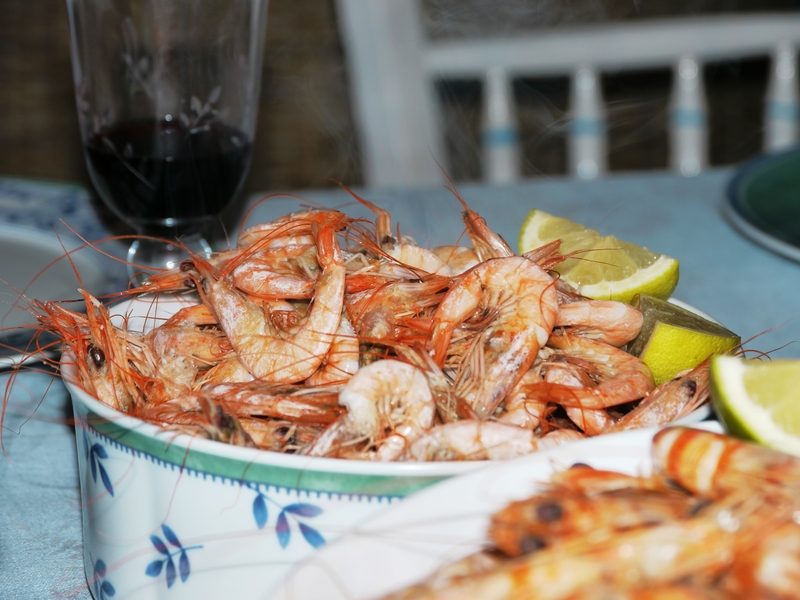 Sergoulas has several taverns where you can choose from a number of freshly made classical greek dishes and even during peak season they always offer – unlike in the touristic parts of Greece – fresh fish. 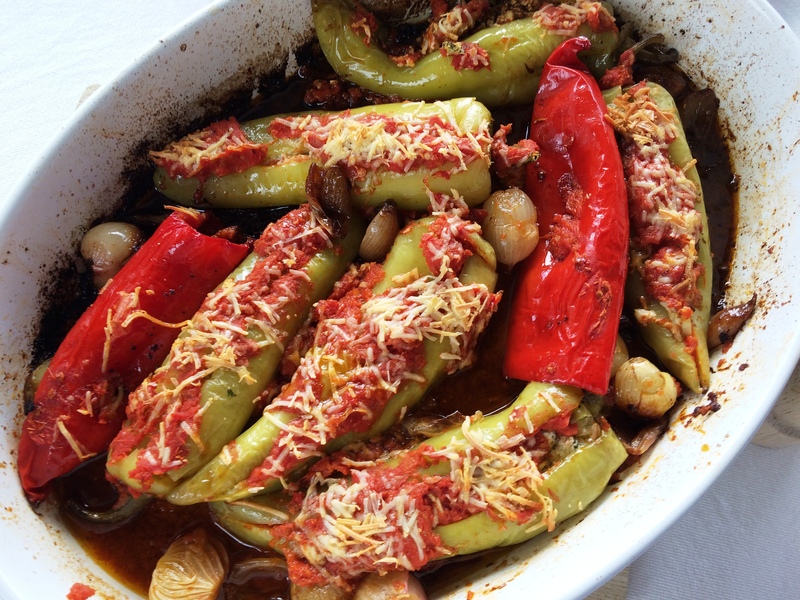 If you want to try another particular speciality (moussaka, rabbit in red wine sauce or filled tomatoes, peppers...) the inkeepers are happy to fulfill this whish on order. Gulf of Corinth in the evening sun. The tavern Thomas, 500 metres from the mill district. 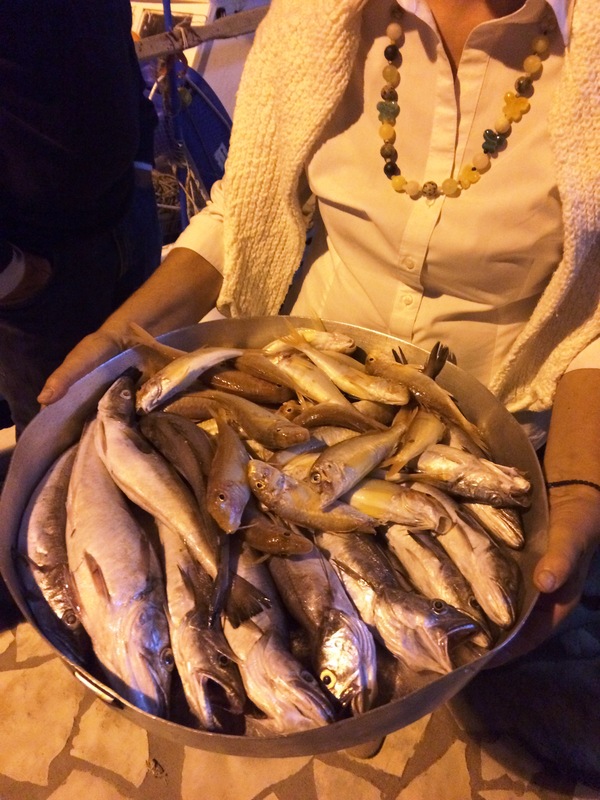 Freshly caught fish at Thanos in Chania. Easter celebration with decorated epitaph. Jia mas - to our guests! 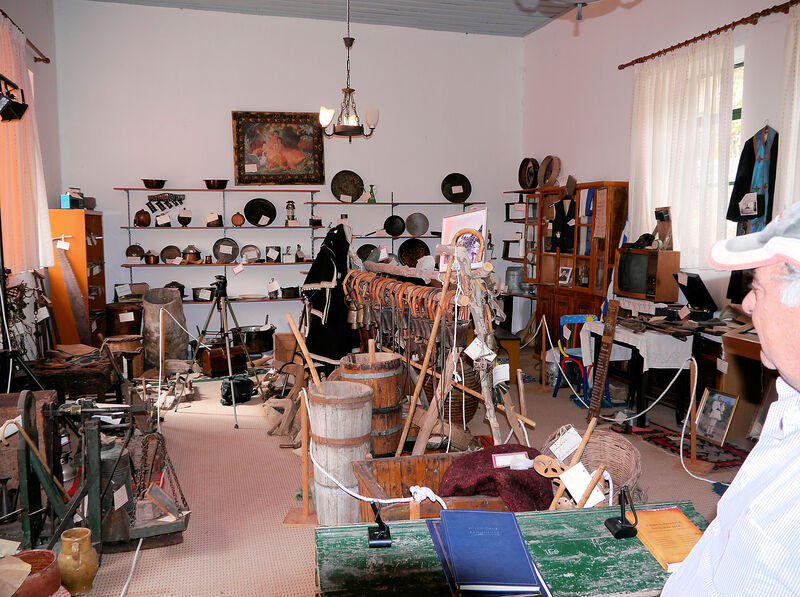 Museum of local history in Old Sergoula in the mountains. Everyday items like bread, sugar, flour, cleansing agents etc. 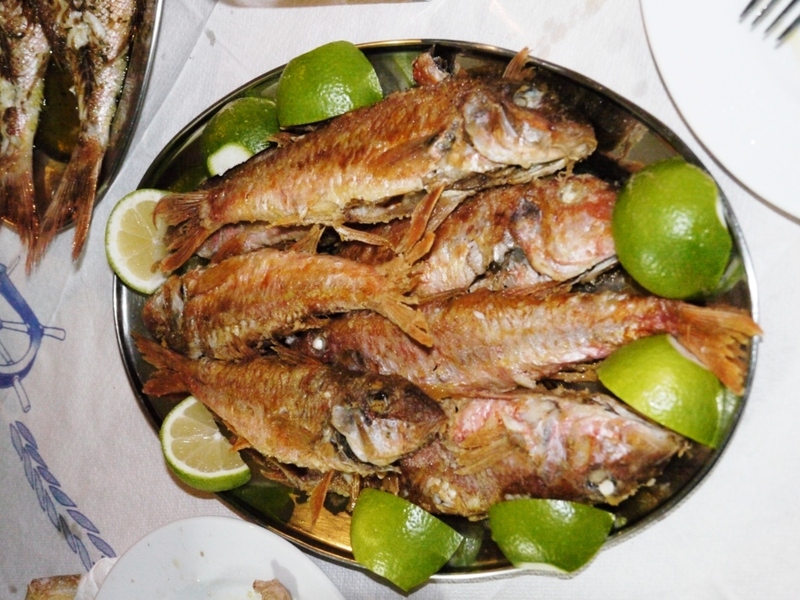 are available in the village or in the neighbouring village of Glifada (about 2 kilometres away). During peak season you will also find peddlars in the village, who sell fresh fruits and vegetables. You hear them offering their goods from far away. 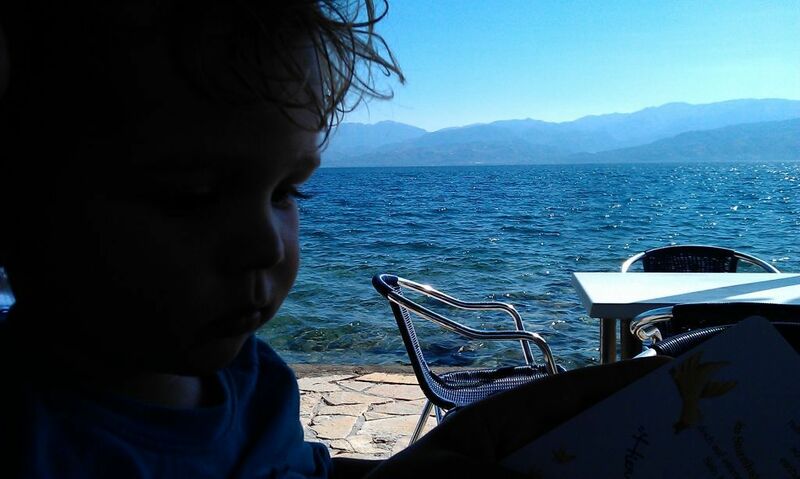 Bigger purchases can be made in Nafpaktos (ancient Lepanto), about 18 kilometres from Paralia Sergoulas. 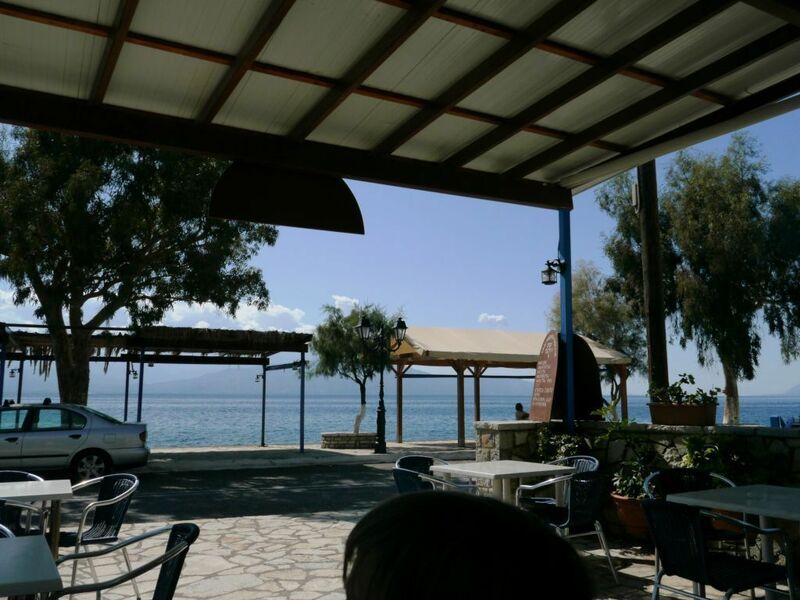 Here, you find everything you need – and before you start your journey home, you can also drink a coffee or ouzo. For this you visit a Kafenion at the harbour, shaded by mighty sycamore trees or at the sea front or you climb up to the castle and watch your greek contemporaries while you consider exposing yourself to the newspapers from home (or rather not). 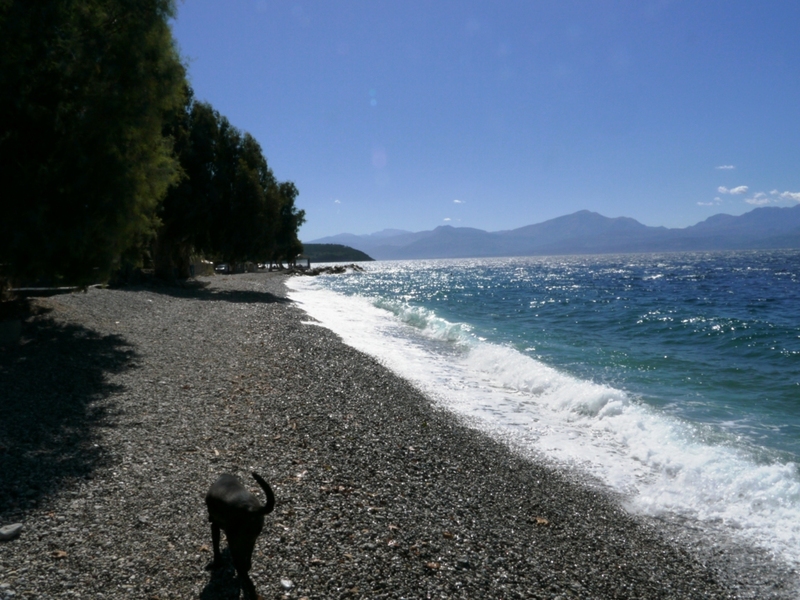 Paralia Sergoulas has a lot of wind, especially in spring and autumn. This makes the climate bearable even in the height of summer and makes the village popular with surfers and yachtsmen. Because of the many visitors in the numerous taverns, the village centre is very busy in the height of summer, especially in August, when the village is filled with greeks from all over the world who want to spend their vacation in their home village. In our houses, at a walking distance of about 5 minutes from the centre, you won't notice any of this. Here, about 200 metres from the ocean and mostly wind-protected, crickets and cicadas provide a stable acoustical background for all your activities. Tavern at the ocean in Sergoula. 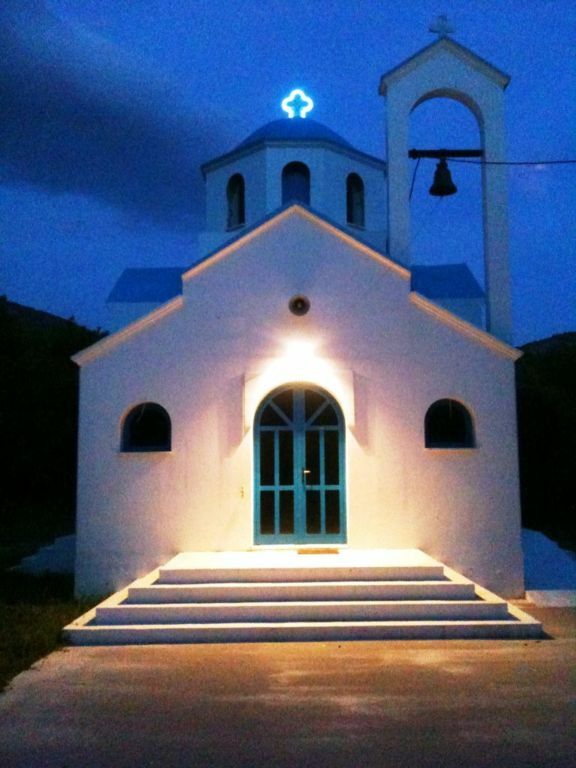 Church "Agia Marina" in the Lidorikis park. Planted boat at the beach. View of Gulf and the opposite Peloponnes. In the beautiful rolling bay of Paralia Sergoulas, several beaches along the promenade or at the end of the village invite you to bath, snorkel or surf. Because of the beautiful pebble beach, the water in the gulf is crystal clear, clean and refreshing. Bathing shoes are recommended, however. 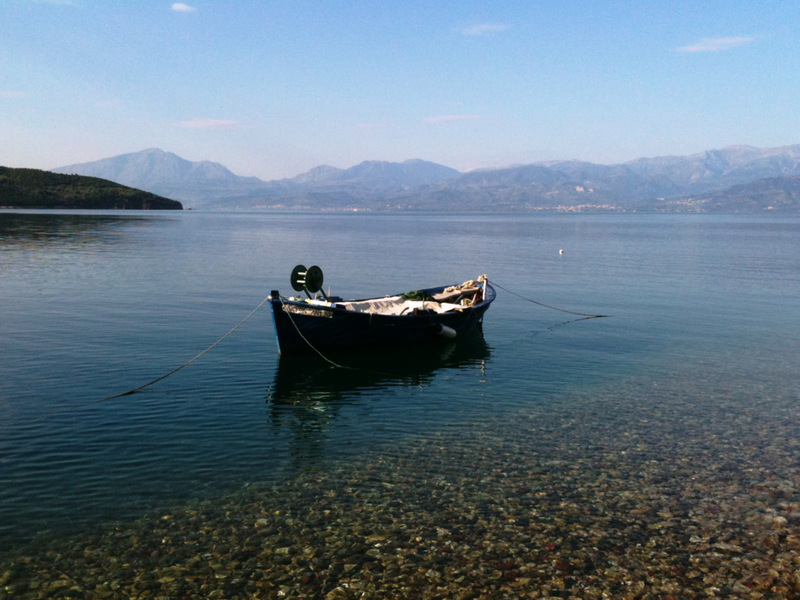 Fishing boat, the Peloponnese can be seen in the background. Pebble beach with crystal clear water (blue flag!). Evening mood at the Gulf.